Ryan Shelton is a church musician and teacher in Evanston, Illinois, where he serves as worship director of Winnetka Bible Church. He is an alumnus of the worship concentration M.Div. program at Bethlehem College & Seminary. I grew up in one of the branches of the church that did not celebrate Advent. Before the leftover turkey disappeared from the refrigerator, we were in full-blown Christmastide through December 25. I was in my twenties before I was introduced to the tradition of Advent, and it frankly did not have much appeal right away. What was the value of four weeks of longing and expectation? It seems so contradictory to the prevailing atmosphere of festive, cheery glow in the shopping malls. But I have grown to love Advent. And though it is not a mandated observance in Scripture, there are profitable reasons to consider making Advent part of your holiday rhythm. Here are seven potential benefits of observing Advent. 1. Advent reminds us we are not the center of God’s plan. Advent is an opportunity to refresh your perspective that God has a grand plan for history that is so much larger than just you and your kin. For all the emphasis on gift-giving and sentimentality that characterizes our cultural holiday, we can tend to focus on our small circles of friends. So in the midst of a season that might shrink our gaze, Advent reminds us to pan the camera back out to the larger scope of God’s purposes for history. Before the foundation of the world, God wrote “the book of life of the Lamb who was slain” (Revelation 13:8), a story culminating in the marriage of the Lamb and his Bride (Revelation 19:7). What a marvel that we are spectacularly included in this grand plan, but we are not individually the main characters in this story. The expectation of Advent points our gaze to a far grander story than our sentimental yuletide inclinations. 2. Advent reminds us of generations of saints longing for the Messiah. Not long ago, it was a luxury to have two-day shipping for online purchases. Now you can have your purchase show up in just a matter of hours. Do modern people even have a category for longing, pining, and waiting? Advent gives us an opportunity to imagine the long-awaited coming of the Messiah, who was promised thousands of years before his arrival in Bethlehem (John 8:56; Hebrews 11:13). Generations of saints had promises from God in Scripture, and types that heightened their yearning for the coming One. As we imagine ourselves in this kind of expectation, we begin to see glimpses of how Jesus expected his disciples to see predictions for his ministry in the entire collection of Scriptures (Luke 24:27, 44), not simply a few isolated prophecies. With this kind of yearning, the pages of the Hebrew Bible rustle with Jesus from Genesis to Chronicles. 3. Advent connects us to centuries of church tradition. Church tradition is not our final authority like Scripture, but we are not the first generation to seek to live faithfully to God’s word. We are naïve to blindly disregard a practice that has been fruitful for so many citizens of God’s Kingdom. We should remember our leaders, and consider the outcome of their faith (Hebrews 13:7), and celebrating Advent is an opportunity to imitate the faith of many faithful leaders who have gone before us. We can avoid what C.S. Lewis called “chronological snobbery” by letting the voices of seasoned saints offer wisdom into our context. 4. Advent brings slowness in the midst of a frantic season. The Christmas holiday, especially in the West, seems to be on a vector towards insanity. Black Friday appears to have no desire to remain confined by a 24-hour window, even while shoppers have literally been reported to stampede retail stores. Students are busy studying for finals, parents are busy shopping for gifts, families are busy traveling to visit relatives — even social calendars can crowd uncomfortably during December. Advent provides opportunity to slow the pace, or even comparatively grind it to a halt. Remember the deliberateness of God. He completed his promise “in the fullness of time” (Galatians 4:4). Whether through daily readings, candle-lightings, or other Advent-themed traditions, we resolve to pause and reflect in a season that could otherwise drown out reflection — and be still. 5. Advent teaches us patience. Patience is a fruit of God’s Spirit (Galatians 5:22). But though it is his work, we may seek out means whereby the Spirit of God can cultivate patience in our hearts. As we observe Advent, God can grow patience in our hearts by demonstrating that God is patient, and not because he is slow (2 Peter 3:9). By remembering the longing for Christ’s first coming, we see God’s mercy. He did not rush into swift destruction of his enemies and triumph of his kingdom — glorious as that will be. Every moment of God’s patience is an opportunity for repentance for those who would otherwise be destroyed in his final coming (Romans 2:4). During Advent we behold the patience of Jesus, and by beholding him we are transformed more into his likeness by God’s Spirit (2 Corinthians 3:18). 6. Advent demonstrates the rarer jewel of Christian discontentment. Puritan author Jeremiah Burroughs wrote of The Rare Jewel of Christian Contentment. And indeed this rare jewel is worth cultivating, especially in view of a mass conspiracy of advertisements designed solely to rob it from you. But not all discontentment ought to be shunned. Where Christian contentment is rare in the vast sea of discontented people, distinctly Christian discontentment may be rarer. How else can the result of the firstfruits of the Spirit be groaning inwardly (Romans 8:23)? What are we to make of the souls of martyrs under the altar of God crying out, “How long, O Lord?” (Revelation 6:10)? We do not have to look far to find reasons to grow in righteous discontentment with the sin-broken world around us, and lift up holy cries of lament. Advent uniquely models this in the Christian calendar, as we remember similar cries for the first coming of Christ, and join their refrain for the second coming. 7. Advent fortifies confidence in the promises of God. Finally, the best application of all of a season of heightened, purposeful remembrance and expectation directs us toward the glorious Second Advent of King Jesus. As we reflect on God’s faithfulness to his promises past, we are reassured in the promises we yet await. Jesus said he is coming soon (Revelation 22:12), and though our concept of soon may seem to have a different calibration than our Lord’s, the Holy Spirit strengthens our faith by tracing the exactitude of God’s faithfulness to the saints long ago. Confidence in the second coming of Christ inspires missions (Matthew 24:14), enables Christian fellowship and mutual encouragement (Hebrews 10:25), and equips us for joyful suffering (Hebrews 10:34). So if you are like me, and did not grow up with the tradition of Advent in your family or church, consider the benefits to your Christian walk this season by joining many in the Christian faith who have found great benefit in purposefully preparing during Advent for the great celebration of Christmas. Let us join the voices of generations of saints past and present in the refrain, O come, O come, Emmanuel. 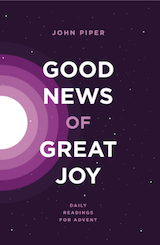 **[Good News of Great Joy: Daily Readings for Advent](http://www.desiringgod.org/books/good-news-of-great-joy)** Advent is for adoring Jesus. 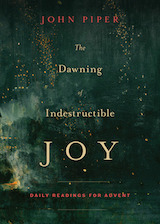 These 25 short daily devotional readings from John Piper begin December 1 and go through Christmas Day. This book of Advent meditations aims to put Jesus at the center of your holiday season. These readings correspond to the daily readings in Desiring God’s free devotional app, Solid Joys (available in iTunes and Google Play), as well as online. The Christmas season is one of the busiest times of the year. But it is also a season of reflection and preparation for that special day when we mark Immanuel’s coming — the arrival of our eternal God in our own frail humanity. 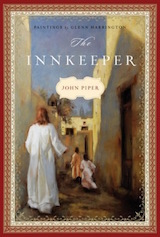 These are 25 more brief devotional readings from John Piper for December 1 to Christmas Day. Our hope is that God would use these meditations to sweeten your adoration of Jesus and help you keep him at the center of your Christmas. For Christmas gift ideas, see Spread the Word for Christmas. Ryan Shelton (@SheltonRyan) is a church musician and teacher in Evanston, Illinois, where he serves as worship director of Winnetka Bible Church. He is an alumnus of the worship concentration M.Div. program at Bethlehem College & Seminary.